Our designer Soft Pad guest seating is perfect for the meeting room, conference room or even the high profile guest/reception area. Modern Office has produced an impressive reproduction now available with Free Shipping and In Stock in a variety of leather colors. The coordinating guest chair is both handsome in design and comfortable for your valued guests and clients. The deep cushioned pads of the Soft Pad chair are upholstered in a soft and supple bonded leather that is excellent for wear and requires no special maintenance. Soft pad design entails suspended cushions in a sling over framework system so the user will never experience a "bottoming-out" feel. 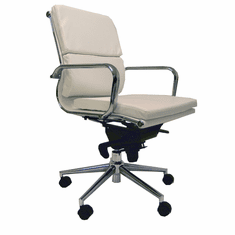 A heavy, one-piece metal frame has factory installed armrests to provide a sturdy and solid feel to the chair while seated. 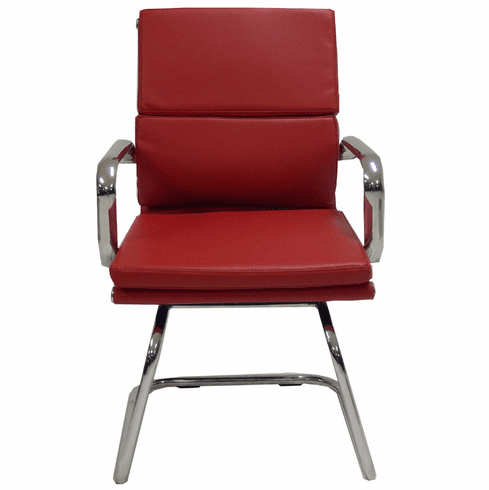 The sturdy tubular cantilever base, arms and back brace support are all finished in chrome to enhance the appearance of this stylish chair and add to its wear and durability. The iconic appearance of this chair will display your good taste and never go out of style. 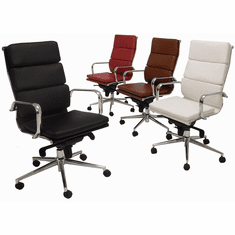 Provides an ideal guest or meeting room chair. Seat measures 19"W x 17"D x 19-1/2"H. Back height measures 18� high above seat cushion. 22"W x 24"D x 37"H overall. Easy assembly (upper chair fully assembled). Shipping weight 36 lbs. All components exceed ANSI/BIFMA commercial use requirements. Meets CA fire foam approval. 5-Year Limited Warranty. PRICE INCLUDES SHIPPING! IN STOCK!